Awesome lunch with my friend Peter for my birthday at Hanks on Church at Front Street in Toronto. It was delicious! Normally wouldn’t eat that type of meal but after all it was my special day so I threw caution to the wind and enjoyed it thoroughly. Definite recommend. 8 oz of Ontario beef dressed with green onion mayo, lettuce, tomato, dill pickle, a crispy onion ring, sautéed mushrooms and swiss cheese on a sesame seed bun. We ordered half fries and half salad just to be good. Yes I did go to the gym that afternoon! Nuff said! My friend and business partner Peter and I decided on a Christmas lunch this year instead of gifts and a big dinner (watching our pennies). We decided to try a new restaurant called Loaded Pierogis on Church street south of Front street. It was right by the St. Lawrence Market so we popped in there first for some fresh food shopping. Loaded Pierogis concept is you get a plate of 8 pierogis either steamed or fried with all kinds of toppings. The price is right and they were delicious. I was so stuffed though from lunch that I didn’t eat dinner that night. Okay so it is not the healthiest of meals but once in a while it is a real treat!. Here is a link to BlogTO where I first heard of this restaurant. Check it out for even more information. 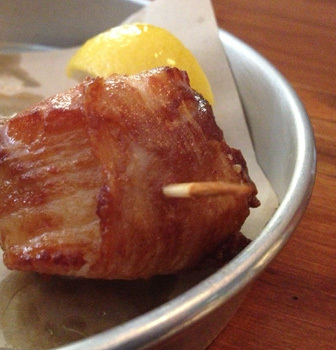 FYI – I had the pierogis with bacon, cheese and caramelized onions. Comes with a dollop of sour cream. (remember – not the healthiest of all meals but a real treat on occasion). 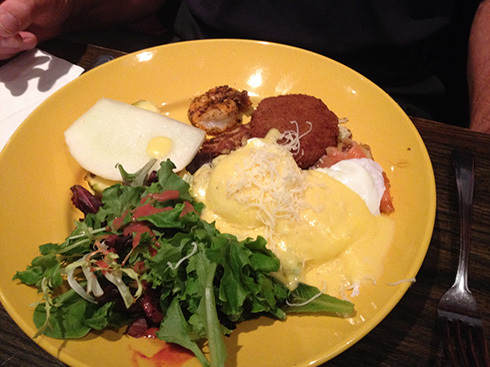 A couple of weeks back I had brunch with a few friends at a great spot called Vivetha. The restaurant is located at 2485 Queen Street East near Victoria Park. I believe they have a second location at Yonge and Lawrence. So Vivetha is one of my favourite places for brunch as it is fresh, delicious, huge and not expensive. All the elements needed for a great meal. (Their dinner is great too by the way). I highly recommend this spot for any meal – I have been for dinner too and the food was great and again the prices very reasonable. I will say the earlier you go though the better as I am not the only person who loves this restaurant! It does get a bit busy at brunch and at dinner. 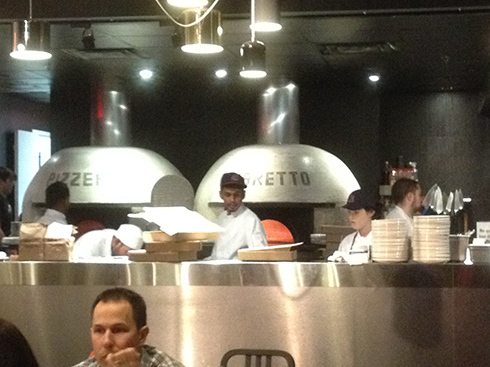 Had dinner the other night with neighbours/friends at a great pizzeria at 321 Roncesvalles called Pizzeria Defina. What a hopping place. We got there at 6:00 and it was already busy. The restaurant is not huge but has a great atmosphere. We all ordered a wood fired pizzas as it was really the house specialty. 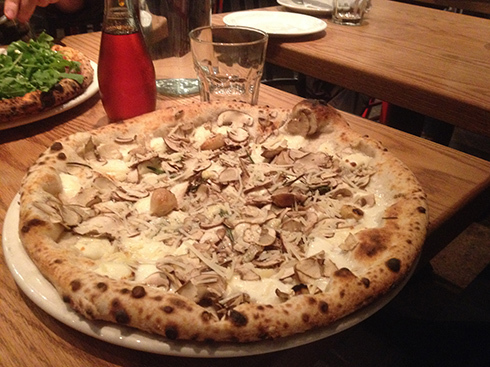 Mine was a wild mushroom pizza with seasonal mushrooms, oyster, cremini, fior di latte, shallots, grana padano, tarragon, truffle oil – all for $17. It was huge! I managed half and took the other half home for lunch the next day. It was still good the following day. Loretta and I shared a caesar salad and there was certainly enough for two. Ginny had the red wine with her dinner and said it was one of the best she had ever tasted. Unfortunately it is not sold in the liquor store. Stew and Gord had the meaty style pizzas which were really good. Loretta had the pesto and chicken pizza which also tasted great. I would certainly recommend this restaurant. My only slight negative remark was that our server was either overworked or just off a bit as she seemed to be forcing herself to be nice to us and not look like she was rushing us (which didn’t alway succeed). A couple of nights ago we took our friend Kim for dinner for her belated birthday. Jane and Kim were coming back to my place for a glass of wine and some nibbles after we all finished a panel at our part time gig as sensory panelists for a major grocery chain. We thought we would just converge at my place before going out and then just walk up to Bloor Street for dinner. We decided on a new restaurant on Bloor called Sparrow. I had heard good reviews and none of us had been there before. I am always excited to try a new place in the “hood” as for the longest time we didn’t have any good restaurants – now we have several to choose from. The inside renovations look great – it used to be a family style restaurant (Dr. Generosity’s) for years and before that it was the Rebel Chop House and before that, some of you may remember it as Mad Apples. They have done a complete overhaul and I thought it looked really nice. Many of the staff are from the previous generation of restaurant and know the biz well and were fabulous. The service was excellent as were the suggestions. The room however was quite dim and the menu had teenie tiny type all in caps so very hard to read without glasses. Once we figured out what we were having, we ordered our meals along with a nice white Bertiolo Italian Pinot Grigio wine (we were all having a seafood dish). The wine was delicious! 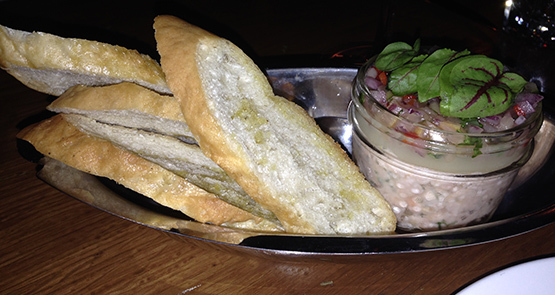 Atlantic Salmon Riletters (Cucumber/Dill/Preserved Lemon/Red Onion/Chives/Crostini) – This was really tasty. 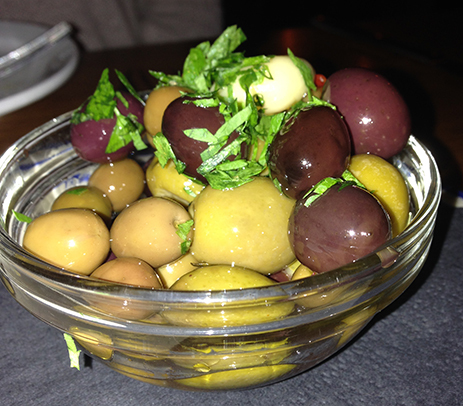 We shared this as a starter along with warm marinated olives that were just wonderful! I ordered the PEI Mussels and both Kim and Jane ordered the Lobster Salad. 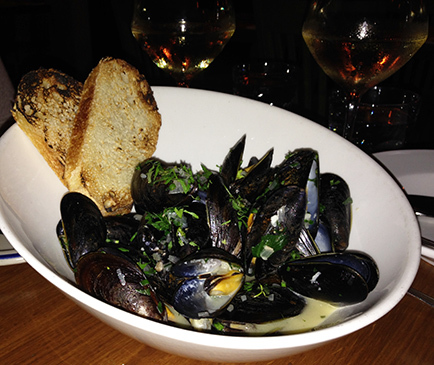 The mussels were listed as being prepared in a Junction Beer Broth with Bacon Butter, Garlic/Summer Herbs and served with Grilled Bread. While I really liked the broth I have to say I found the mussels just okay (a few of the shells were empty) and more than half of them were gritty. I don’t think I would order them again. 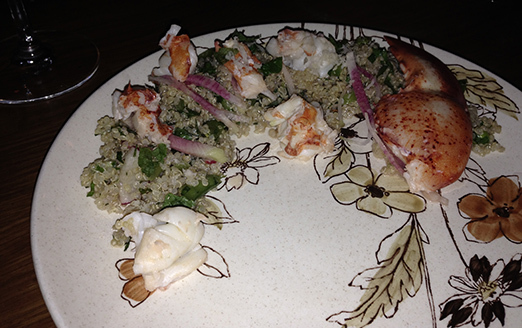 The Lobster Salad was made up of the following: Poached East Coast Lobster with Quinoa, Radish, Snap Peas, Horseradish and Mint. 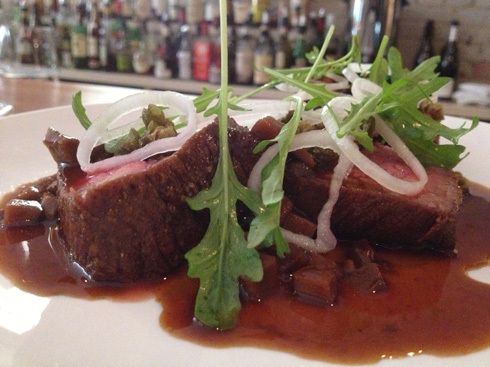 Sounds great and it tasted great, it was just the plating that had us mystified. See the picture below and you may be able to tell why….When the plate arrive all three of us wondered where the missing food was as the salad was served along one side of a large dish (I am sure working with the unique design of the plate) with a huge bare section. While the plate had a lovely design to it – it looked empty! A small green salad would have just made the plate but alas it was bare. We all thought it could have used the greenery on the plate to fill it out. Unfortunately the emptiness of the plate overshadowed the artistic arrangement of the food. All in all, the wine list was great, the service wonderful, the appetizers yummy but perhaps we really didn’t order well. A plate of lamb chops went by that looks delicious for $18. Perhaps we should have stuck to meat dishes as opposed to the seafood…..
PS – I am apologizing for the quality of the images as the lighting was quite dim and even with a flash the images were rather dark. I had dinner on Wednesday evening with my friend Susan on Roncesvalles (great area in Toronto’s west end with some fabulous restaurants, stores and buildings). 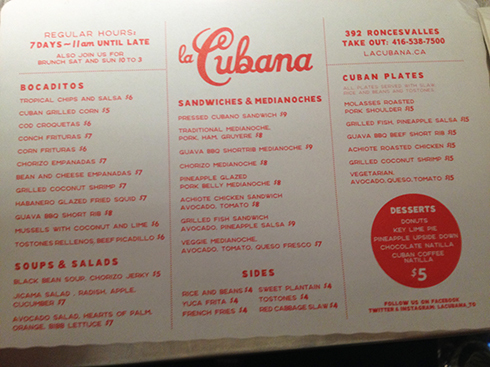 We met up at a new place called La Cubana. 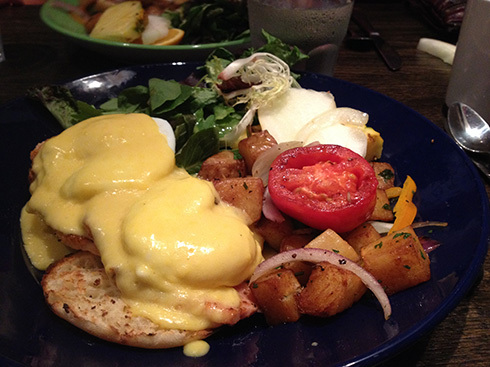 It is a casual place with a great patio in the back and a fair amount of seating inside. We sat at the bar because I love to watch the chefs cook and plate the food and we always have good service since the bartender is always around. Tonight was no different. The restaurant is very new so they are still getting a few things tied down but I would go back in a minute. Here is what we ate and just a quick FYI – the meal including tax and tip came to $19 each (no drinks we just had water). Not bad! We shared two dishes and a “BOCADITO” which is an appetizer. 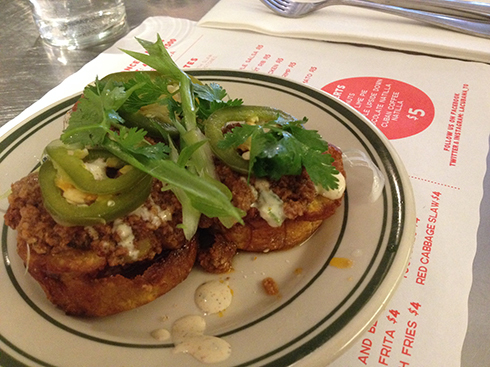 For the appetizer we went with the most popular dish which was TOSTONES RELLENOS, BEEF PICADILLO. These were fried plantains topped with a marinated ground spiced beef and drizzled with a white sauce, topped with peppers and onions and cilantro. Delicious!!!! Next dish was a PRESSED CUBANO SANDWICH which was a variety of ham, gouda and a few other items that I just couldn’t write down fast enough. 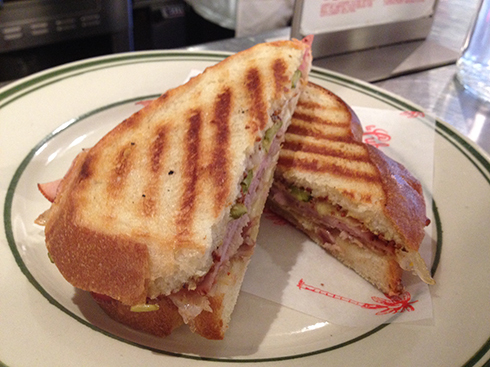 Great sandwich and served like a panini. 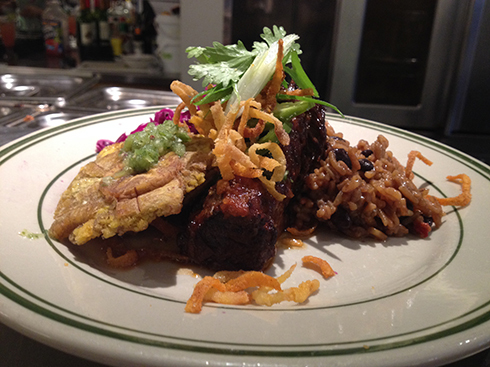 Next up we shared the GUAVA BBQ BEEF SHORT RIB plate. Yum! 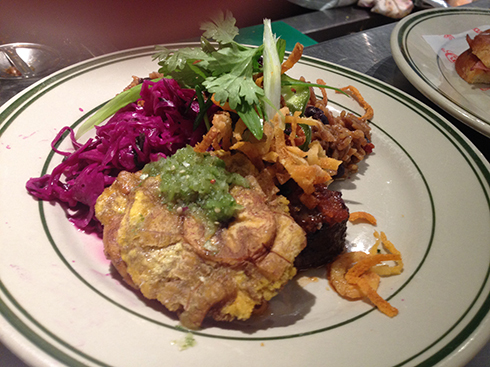 This was a slow braised short rib with purple coleslaw, rice and beans and a TOSTONE (still not sure what it was but it sure tasted good – seemed to be plantain slices fried together maybe). Great meal for a great price! I can see this becoming a go to hang out. This is a definite recommend!!! Here is the menu for the restaurant. The other night my dear friend and business partner Peter took me out for dinner. We managed to get a coupon from Groupon for a Spanish style tapas restaurant called Embrujo Flamenco located at 97 Danforth Ave in Toronto. All I can say is “wow what a great meal!” It was a Thursday night so no Flamingo dancing show but the attentive staff and wonderful food certainly made up for that. With the coupon we got 6 tapas (although one or two of the tapas offered counted as two orders), and a small glass of Cava to start. 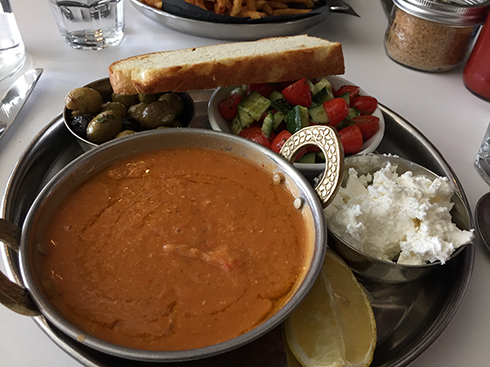 Here is what we ordered – keeping in mind Peter doesn’t eat anything that swims ( 😉 ) we had a salad to start, then a couple of meat dishes, a side dish and a dessert style dish to finish. We just smiled when they offered dessert as we were both completely full when we finished. We went for a walk after and stopped for a coffee. All in – it was a great evening. 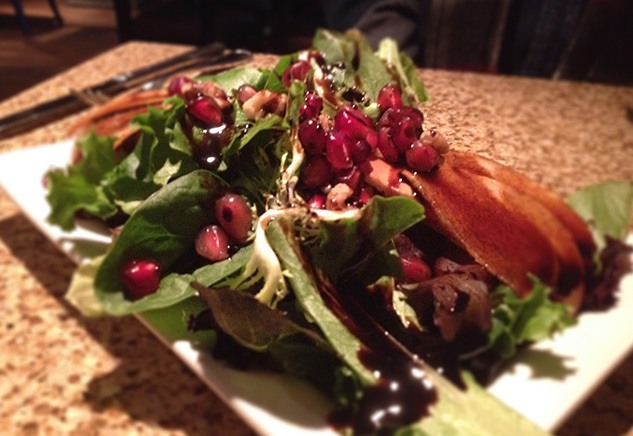 1) Mixed green salad with pear and walnuts (sprinkled with pomegranate seeds and a balsamic glaze). This was delicious! 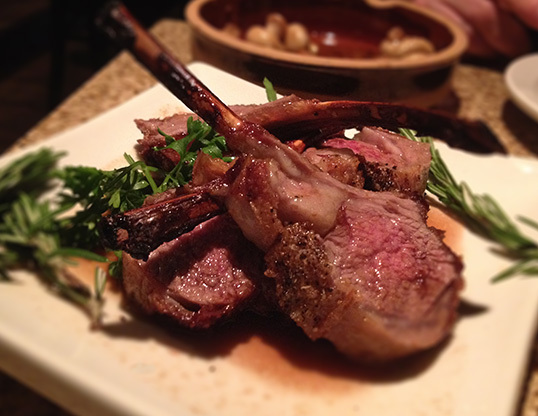 2) Rack of lamb with a fresh fig sauce – this order counted as two – we got 4 nice size chops and the flavour was wonderful! Cooked to perfection! 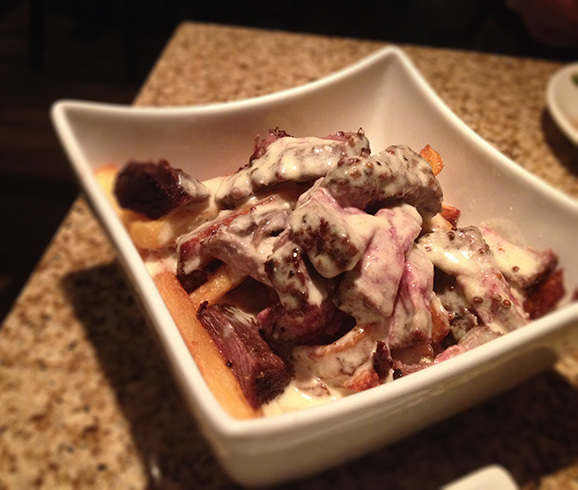 3) Sirloin chunks on a bed of home cut fries topped with a light mustard sauce – This was like a spanish poutine but even better. The sauce was light and creamy and didn’t over power the other items. Perfectly cooked steak. 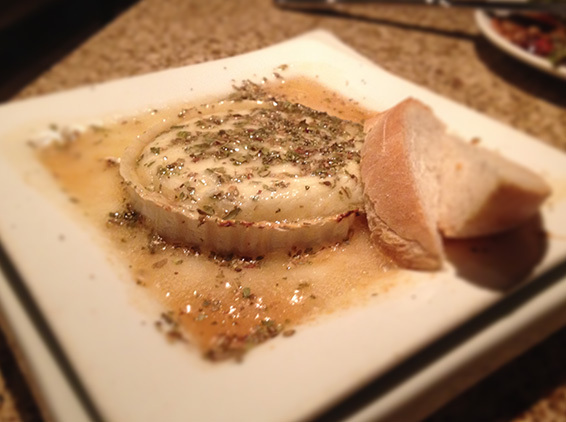 5) Baked goat cheese with honey and herbs – we used this as dessert since it had a lovely sweetness to it. I could have licked the dish clean. Made me think of a salad dish I could make with a green salad, roasted nuts, a balsamic dressing and a slice of baked or sautéed goat cheese on top. Must try that – I’ll blog about that salad when I make it. I woke up thinking about how good this meal was the next morning! It’s a definite recommendation! 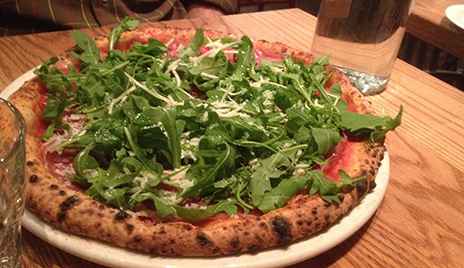 Well Peter had the fresh arugula with Ontario prosciutto, garlic, tomato, oregano, basil and shaved grana padano cheese. His pizza was quite delicious and very fresh tasting. I chose the cremini mushroom with bufala mozzarella, goronzola, roasted garlic, rosemary, thyme and pecorino (I did ask them to leave out the thyme as it is not my favourite herb). While mine tasted fine – Peters was definitely better in my books – more flavour. 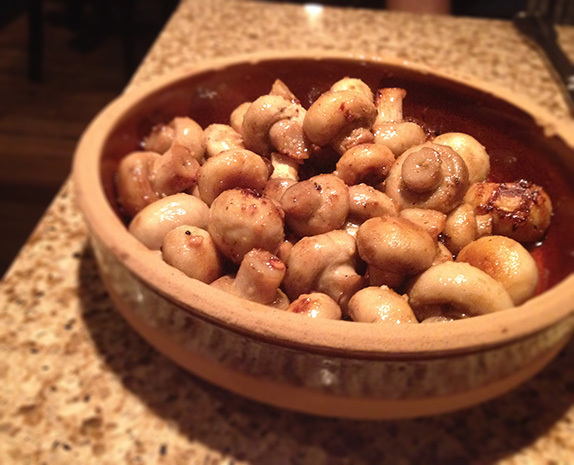 I love mushrooms but I guess when they are only baked for 90 seconds albeit at 900 degrees – they don’t release much of their flavour so I found mine a bit bland. Also the center of the pizza is very very thin and quite moist so you cannot pick a piece up with your fingers and eat it – you need to use a knife and fork. I am not saying this is a bad thing it is just different from that usual. I will say that adding the hot chilli oil helped add flavour to my pizza. Peters was certainly more flavourful though but same issues with the centre. 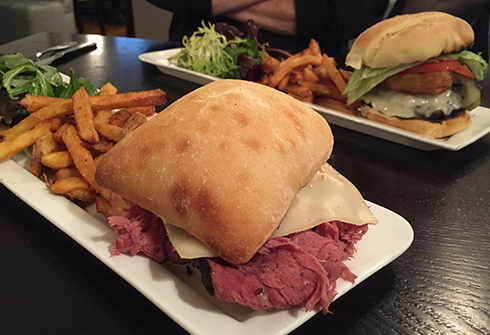 Portion size is big – I couldn’t finish mine. The cost for mine was $17 and for Peters – $16. Not crazy high prices and it certainly was large enough to share along with a salad I think. 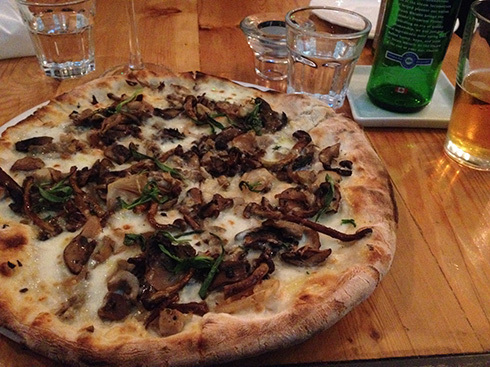 All in all – Yes I would go back but no, I would not order the mushroom pizza again. I would try something different. 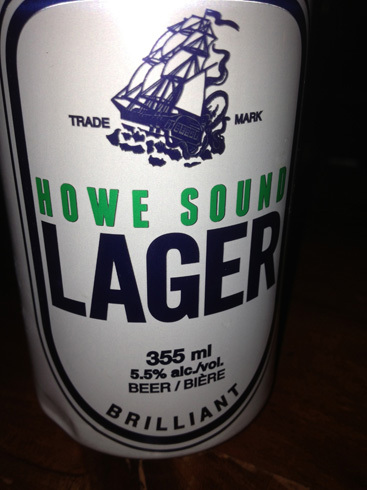 • Anne had a glass of white wine and I a “Howe Sound Lager” – never heard of this before but it was one of the best beers I have ever tasted! We shared everything and including tax and tip the bill was $38 each. Not bad. We had nice service (love sitting at the bar and smoozing with the staff behind the bar. I would say this was a really good restaurant – one that I would certainly go back to. Went for another walk after dinner and all in all had a great day!